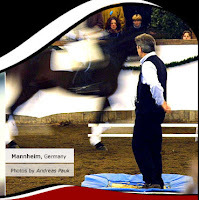 Behind the Bit: Richard Weis: "The posture does the riding"
Richard Weis: "The posture does the riding"
Just read an article by Richard Weis: The posture does the riding. The article is a handout from a demonstration given in Germany. The Horse Magazine did a summary of the demo, with pix, that I also recommend. Weis emphasizes the importance of the rider's position, or more specifically the rider's balance, and how it affects the horse. I've more often thought of rider aids as hands, seat, leg, etc. Weis makes it clear that the rider's weight is at least as important. If we cannot balance ourselves while riding, the horse cannot be balanced. Sobering news for those of us who battle the "chair seat." "Before we can control the horse we need a high degree of control of ourselves. Gaining this is our first responsibility." "Directing the horse becomes a whole body experience... Eventually the horse learns to follow the rider by keeping his center of gravity under the rider's weight." "The rider makes himself a good load to carry. To be a good load we must stay in balance, i.e., keep our head over our center of gravity over our feet." "When we sit on a horse we take an attitude between sitting and standing. We support some weight through our seat and some through the stirrups so we are neither sitting or standing, but doing a bit of both at once." "All our weight travels through the horse and and is supported ultimately by the ground and the pull of gravity... The center of gravity is over the feet at all times." "[At the trot] the horses back not only comes up, it travels forward. The rider needs to spring his torso forward just enough to land his seat over his feet where the legs act as shock absorbers, softening the jar on the rider's back and the horse's back." The posture does the riding A presentation by Richard Weis and Susanne Miesner. This was a handout given to around 2000 participants at the DOKR in Warendorf, in Mannheim, and in Berlin. weight aids are some of the most powerful simply because they directly affect the horse's balance. also, they require little or no training, as the horse responds to them instinctively. as for the rider, well-placed weight aids eliminate the need for many leg and rein aids, and have the benefit of never getting tired. horses can learn to mirror the rider's position with their own to a degree (i've just done a post on the turning seat, which works on the same concept,) and understanding the horse's movement and balance while being able to position one's own body properly is intrinsic to good riding - but 'mirroring' does have its limits, such as riders who mistakenly think that riding behind the motion and/or leaning back will encourage the horse to shift it's center of gravity backward and engage the hindquarters, when all it seems to do is disrupt the horse's balance and movement while hollowing the back - the exact opposite of the desired effect! the rider looks nice but the horse is severely behind the bit, extremely over-bent and on the forehand, and horse is poorly coordinated as the front and back legs of the forward moving pair of legs are at different stages of movement . This can't be good for the horse.